In the Years 1810, 1811, and 1812. Scheme which was laid before General Von Gaudy. This is the 1873 translation of Carl von Clausewitz's 1812 "Die wichtigsten Grundsätze des Kriegfuhrens zur Ergänzung meines Unterrichts bei Sr. Koniglichen Hoheit dem Kronprinzen," made by Colonel James John Graham, originally published as an appendix to Graham's translation of Carl von Clausewitz, On War (London: N. Trübner, 1873), in German Vom Kriege (Berlin: Dümmlers Verlag, 1832). This document was written for Clausewitz's student, the then-16-year-old Crown Prince, the future King Friedrich Wilhelm IV of Prussia (b. 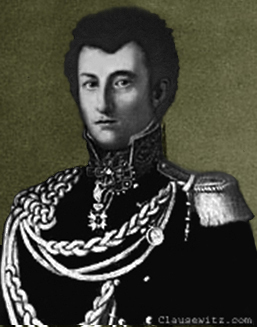 1795, r.1840-1861), prior to Clausewitz's departure to join the Russian army to fight against Napoleon in his invasion of Russia in June 1812. This version of the document differs from the later translation of Principles of War by Hans W. Gatzke (The Military Service Publishing Company, 1942), which is also available on The Clausewitz Homepage. Whichever version you read, Remember that Principles of War (1812) is NOT a 'summary' of On War (1832) but a distant and quite different precursor. PRESUMING that it is only a preliminary knowledge of the art of war which His Royal Highness the Crown Prince is to receive from me, with a view to His Royal Highness being enabled to understand modern military history, it is of the first importance that I should give the Prince a clear idea of war, and that I should do so in such a manner as to avoid diffuseness, or taxing the Prince's faculties too much. In order to acquire a thorough knowledge of a science, it is necessary to apply one's mind chiefly to the study of it for some time, and it appears to be too soon for the Prince to do this. For these reasons I have adopted the following course, which appears to me most in accordance with the natural direction of the ideas of a young man. In carrying it out my chief endeavour will be, in the first place, to make myself always intelligible to the Prince, as otherwise the most attentive pupil must soon become wearied, confused and disgusted; secondly, in every case to avoid giving any erroneous ideas, through which his further instruction or the progress of his own studies might be impeded or interfered with. For the sake of the first of these objects, I shall endeavour to keep the subject always in correspondence with the natural understanding as much as possible, and in this effort shall often deviate from the scientific spirit and scholastic forms. I now submit to Your Excellency the plan I have sketched hastily, and beg you will do me the favour to correct my view in any points in which it may not be in accordance with your own. NEXT to a preparatory knowledge of weapons and the different kinds of troops, some conception of applied or higher tactics, as they are called, and strategy, is principally necessary in order to comprehend military history. Tactics, or the theory of fighting, is in reality the principal thing, partly because battles are decisive, partly because it comprises the most of what can be taught. Strategy, or the theory of the combination of separate battles towards the object of the campaign, is a subject more of natural and matured power of judgment; still, we must at least point out clearly the subjects which are therein to be found, and show their mutual connection and relation to the whole. Field fortification in such a synoptical course will be most suitably placed with the theory of the defensive in tactics, permanent fortification in or after strategy. Tactics itself comprises two different classes of subjects. One class may be understood without having an acquaintance with the strategic relations of the whole; to this belong the formation for tactical purposes, and the mode of fighting of all the smaller parts, from the company or squadron, up to a brigade of all arms, and in all kinds of country. Those of the other class are in intimate connection with strategic conceptions; to this class belong the usual action of whole corps and armies in battle, outpost services, and the minor operations of war, etc., etc., because in such there are introduced conceptions of position, battle, march, etc., which cannot be understood without previous conceptions of the combination of the whole campaign. I shall, therefore, separate the two classes of subjects; begin with a concise and very general description of war, pass on to tactics, or the action of the smaller divisions in battle, and then stop short when I reach the position (order of battle) of whole corps or armies, in order to return to the general view of the campaign, and to explain more in detail the connection of things; then the remaining chapters on tactics will follow. Lastly, I shall begin strategy again, with the idea of the course of a campaign, in order to consider the subject from this new point of view. From this now follows the arrangement as under. Powder, small arms, rifles, cannon, and all appertaining thereto. Theory of charges for horizontal and vertical firing. Service of cannon of all kinds. Expense of guns, and ammunition, etc. Effect of artillery—ranges—probability of hitting. A general conception of war—battles. Position of smaller divisions, and their mode of fighting. A company of infantry with or without artillery on all kinds of ground. A squadron of cavalry the same. Ditto in different kinds of ground. Order of battle for a corps of several brigades. Ditto of an army of several corps. The two last sections without relation to ground, because otherwise the idea of position would be introduced. More detailed explanation of a campaign. Organisation of army at the commencement of a campaign. Whilst it marches, and takes up positions, it requires measures of security — outposts — patrols — reconnaissances — detachments — minor warfare. When an army chooses a position, such arrangements must be made that the army can defend itself in the same — tactical defensive — field fortification. Attack of the enemy in such positions — conduct to be observed in the combat itself — battle — retreat — pursuit. Marches — defence of rivers — passage of rivers — lines of posts — cantonments. View of a campaign and of a whole war in strategic respects. What determines the result in war. Plan of operations — arrangements for subsistence. Positions — lines of posts — battles — marches — defence and passage of rivers. System of war, etc. etc. Permanent fortification and siege warfare either precede strategy or form a conclusion to the whole. The Most Important Principles of the Art of War to Complete my Course of Instruction of his Royal Highness the Crown Prince. ALTHOUGH these principles are the result of much reflection and an assiduous study of military history, they have only been drawn up hastily on the present occasion, and the form in which they appear will not bear any stringent criticism. Besides, from the multiplicity of subjects, only the most important have been selected, a certain conciseness being essentially necessary. These principles, therefore, do not constitute a complete course of instruction for your Royal Highness. They are only intended as a foundation for reflection on your own part, and to serve as a guide in these reflections. 1. THE great object of the theory of war is to guide us to the way of obtaining a preponderance of physical force and advantages at the decisive points; but if this is not possible, theory teaches also how to speculate upon the moral powers; upon the probable errors of the enemy, upon the impression made by a bold spirit of enterprise, etc., etc.—even upon our own desperation. All this is by no means beyond the province of the art of war and its theory, for that theory is nothing but rational reflection upon all situations in which we can be placed in war. The most dangerous positions in which we can be placed are just those which we should look upon as most likely to occur, and those about which we should most distinctly make up our minds. That leads to heroic resolves founded on reason. Whoever represents the affair to your Royal Highness in any other manner is a pedant, who can only do harm by the views he advances. In the critical moments of life, in the tumult of battle, you will one day feel clearly that no other view can give any help when help is most necessary, and when a dry pedantry of figures leaves us to our fate. 2. Naturally in war we always seek to have the probability of success on our side, whether it be that we count upon a physical or moral superiority. But this is not always possible; we must often undertake things when the probability of our succeeding is against us, if, for instance, we can do nothing better. If, in such a case, we despair, then our rational reflection and judgment leave us just when most wanted, when everything seems to conspire against us. Therefore, even when the probability of success is against us, we must not, on that account, consider our undertaking as impossible or unreasonable; reasonable it will always be if we can do nothing better, and if we employ the few means we have to the best advantage. In order that in such cases we may never lose equanimity and firmness, two qualities which in war are always the first to be in peril, which, in such a situation, are difficult to maintain, but without which, with the most brilliant qualities of the mind, we can effect nothing, we must familarise ourselves with the idea of falling with honour; cherish that idea constantly and completely accustom ourselves to it. Be convinced, most noble prince, that without this firm determination nothing great can be effected in the most fortunate war, to say nothing of an unfortunate one. We may be certain that this idea often occupied the mind of Frederick II. during his first Silesian campaign; and because he was accustomed to it he made the attack at Leuthen on that memorable 5th December, and not because he had made a calculation that with the oblique order of battle he would in all probability beat the Austrians. 3. Amongst all the operations left to your choice in any given case, amongst all the measures which are open to adoption, there will always be a choice between the bold and the prudent. Some people think that theory is always on the side of the prudent. That is false. If theory could give advice in the matter, it would counsel the most decisive, consequently the boldest, as that is most consistent with the nature of war; but it leaves to the general to choose according to the measure of his own courage, of his spirit of enterprise, and confidence in himself. Choose then according to the measure of these inner powers; always remembering that there never was a great general who was wanting in boldness. 1. To keep troops on the defensive under cover from fire as long as possible. As we may be attacked, consequently may have to defend ourselves, at any moment, except when we are ourselves acting on the offensive, we must therefore always take up a position as much under cover as possible. 2. Not to bring the whole force into action at once. If this fault is committed, all rational guidance of the combat is at an end; it is only with disposable troops that we can turn the course of a battle. 3. To trouble ourselves little about the width of our front, as it is a matter of little consequence in itself, and the depth of the position (that is the number of troops placed one behind the other) is diminished by an extension of the front. Troops which are in rear of the front line are disposable; they can either be used to restore the combat at that point or be brought forward at other adjacent points. This principle follows from the preceding. 4. As the enemy, whilst he attacks some part of the front, often seeks to outflank and envelop at the same time, therefore, the troops placed in rear are available to repel such attempts, and accordingly supply the want of local obstacles on which to rest the flanks. They are better placed for that purpose than if they stood in line and extended the width of the front, for in such case they themselves would be easily turned by the enemy. This point also further establishes the second. 5. If there are many troops to be posted in the rear, only a part should be placed directly behind the front, the rest are placed in an oblique direction (in echelon) to the rear, beyond either flank. From this last position, the enemy's columns approaching to turn our flank, can in turn be taken in flank. 6. It is a first maxim never to remain perfectly passive, but to fall upon the enemy in front and flank, even when he is in the act of making an attack upon us. We adopt the defensive therefore on a certain line only to compel the enemy to develop his forces for the attack of that line, and we then pass over to the offensive with troops which have been kept in reserve. As Your Royal Highness once justly remarked, The art of field fortification is not to serve the defender like a wall behind which he can stand in greater security, but to aid him in attacking the enemy with more success,—the same applies to every passive defence: it is always only the means of attacking the enemy with advantage on ground that we have looked out and prepared for ourselves, and where we have drawn up our troops. 7. This attack, belonging to the defensive, may be made either at the moment the enemy opens his attack on us, or whilst he is on the march to do so. It may also be arranged so that, when the enemy commences his attack, we draw back and thus lure him on to ground of which he is ignorant, in order to fall upon him on all sides. For all dispositions of this kind, the deep formation of an army, that is an order in which only two-thirds or the half, or even less, are in front, and the rest posted directly and obliquely in rear, under cover if possible, is very well suited; and, therefore, this order of battle is a point of infinite importance. 8. Therefore, if we have two divisions, it is better to place one behind the other than to place them in line: with three divisions, one at least should be placed in rear; with four, probably two; with five, at least two, in many cases, three, etc., etc. 9. At the points where we remain passive, we should make use of field fortification, but only in separate enclosed works of bold profile. 10. In forming a plan of battle, we should have a great object in view, as, for example, the attack of a strong column of the enemy, and a complete victory over it. If we only choose a small object, whilst the enemy pursues a great one, we shall evidently be the losers. We play with thalers against pfennings. 11. If our plan of defence is aimed at some great object (the destruction of a column of an enemy, etc. ), we must follow it up with the utmost energy, expend upon it all our forces. In most cases, the efforts of the assailant will be in some other direction; whilst we fall upon his right wing, he will be seeking to gain an advantage with his left. If we slacken our efforts sooner than the enemy, if we follow up our object with less energy than he does, he will attain his object, he will gain his advantage completely, whilst we shall only half reach ours. Thus the enemy obtains the preponderance, thus the victory becomes his, and we must give up even our half advantage gained. If Your Royal Highness reads attentively the account of the Battles of Ratisbonne and Wagram, you will see both the truth and importance of this. In both these battles the Emperor Napoleon attacked with his right wing, standing on the defensive with the left. The Archduke Charles did the same. But the one did it with full resolution and energy, the other was undecided, and stopped always half way. The successes gained by that portion of the Archduke's army which was victorious, were unimportant; those which the Emperor Napoleon gained in the same time at the opposite point, were decisive. 12. If I may be allowed to bring forward once more the two last principles, the combination of them yields a maxim which, in the modern art of war, may be regarded as the first among all causes of victory, that is: to follow up a great and decisive object with energy and perseverance. 13. Danger in case of failure is increased thereby, it is true; but prudence increased at the cost of victory is no art; it is a false prudence which, as already said, is opposed to the very nature of war; for great ends we must venture much. True prudence is, if we risk anything in war, to select and apply carefully the means to our end, and to neglect nothing through indolence or want of consideration. Of this kind was the prudence of the Emperor Napoleon, who never followed great objects timidly and with half measures through over-prudence. Among the few victorious defensive battles that are noted in history, you will find, noble sir, that the greatest were fought in the spirit of these principles, for they are principles derived from the study of history. At Minden, the Duke Ferdinand suddenly appeared on a field of battle on which the enemy did not expect him, and proceeded to the attack; whilst at Tannhausen he defended himself passively behind entrenchments. At Rossbach, Frederick II. threw himself on the enemy at a point and at a time where his attack was not expected. At Leignitz, the Austrians found the King in the night in quite a different position from that in which they had seen him the day before; he fell upon a column of the enemy with the whole weight of his army, and defeated it before the others could take part in the engagement. At Hohenlinden, Moreau had five divisions in his front and four behind him, either directly or obliquely to the rear; he turned the enemy, and fell upon the right-flank column before it could carry out its intended attack. At Ratisbonne, Marshal Davoust defended himself passively, while Napoleon with the right wing, attacked the fifth and sixth corps d'armée, and completely defeated them. At Wagram the Austrians were, in reality, on the defensive, still as they attacked the Emperor on the second day with the greater part of their force, we may look upon the latter as acting on the defensive. With his right wing he attacked the Austrian left, turned and beat it, not troubling himself meanwhile about his weak left wing (consisting of a single division), resting on the Danube; but by means of his strong reserves (deep position) he prevented the victory of the Austrian right wing from having any influence on the victory which he had gained on the Russbach. With these reserves he retook Aderklaa. All the foregoing principles are not plainly exemplified in each of the battles enumerated, but all are examples of an active defensive. The mobility of the Prussian army under Frederick II was a means to victory for him, upon which we can no longer build, as other armies are as capable of moving as ours now. On the other hand, at that time the turning a flank was less generally in vogue, and, therefore, the deep order of battle was less imperative. 1. We try to fall upon a point in the enemy's position; that is, a part of his army (a division, a corps), with a great preponderance of force, whilst we keep the other parts in uncertainty, that is to say, occupy them. It is only in this way that when our forces are equal or inferior, we can fight with the superiority on our side, that is, with a probability of success. If we are very weak, then we can only spare very few troops to occupy the enemy at other points, that we may be as strong as possible at the decisive point. Unquestionably Frederick II. only gained the battle of Leuthen because he had his small army on one spot and well-concentrated, as compared with the enemy. 2. The principal blow is directed against a wing of the enemy's force by an attack in front and flank, or by completely going round it and attacking it in rear. It is only if we push the enemy off his line of retreat by the victory that we gain a great success. 3. Even when in strong force we often choose only one point for the great shock, and give the blow against that point the greater strength; for to surround an army completely is seldom possible, or supposes an immense preponderance both physically and morally. But the enemy may also be cut off from his line of retreat by an attack directed against a point in one of his flanks, and that is generally sufficient to ensure great results. 4. Generally the certainty (high probability) of the victory—that is, the certainty of being able to drive the enemy from the field of battle, is the principal point. Upon this, as an object or end, the plan of the battle must be formed, for a victory once gained, even if it is not decisive, is easily made so by energy in pursuit. 5. We endeavour to make our attack concentrically on that wing of the enemy which is to receive the shock of our main body, that is, in such a form that his troops find themselves engaged on all sides at once. Allowing that the enemy has troops enough to show a front in all directions, still the troops, under such circumstances, become more easily discouraged; they suffer more, are sooner thrown into disorder, etc. ; in short, we may expect to make them give way sooner. 6. This turning of the enemy compels the assailant to develop a greater force in front than the defender. If the corps a, b, c, are to fall concentrically (or by converging lines) on the part e of the enemy's army, they must naturally stand on lines contiguous to each other. But this development of our force in front must never be carried so far that we do not retain strong reserves. That would be the greatest error possible, and would lead to defeat, if the enemy is only in some measure prepared against being out-flanked. If a, b, c, are corps intended to attack e a part of the enemy's army, then the corps f g must be kept in reserve. With this deep formation we can incessantly renew our attacks upon the same point, and if our troops are repulsed at the opposite extremity of the enemy's position, we are not obliged to give up the day at this, because we have a set-off to any success the enemy may have gained. It was thus with the French at Wagram. The left wing, which was opposed to the Austrian right resting on the Danube, was extremely weak and was totally defeated. Even their centre at Aderklaa was not very strong, and was obliged to give way to the Austrians on the first day. But that did not signify, because the Emperor's right, with which he attacked the Austrian left in front and flank, had such a depth that he brought a heavy column of cavalry and horse artillery to bear upon the Austrians in Aderklaa, and if he did not beat them, was able, at all events, to stop their progress. 7. As in the defensive, so in the offensive, that part of the enemy's army which, in its destruction, will yield decisive advantages, should be the object of attack. 8. As in the defensive, so here, we must not relax our efforts till we have attained our object, or that our means are entirely exhausted. If the defender is also active, if he attacks us at other points, we have no chance of the victory except by surpassing him in energy and boldness. If he remains passive then, in that case, we run no great danger. 9. Long, continuous lines of troops are to be particularly avoided, they only lead to parallel attacks which are now no longer to the purpose. Each division makes its own attack, although in conformity with the plans of higher authority, and consequently so that they accord with each other. But one division (8000 to 10,000 men) is never now formed in one line, always in three or four; from this it follows that no long continuous lines can be used any more. 10. The attacks of divisions or Army-Corps in concert, must not be combined with the intention of their being under one guidance, so that although at a distance from each other, and perhaps even separated by the enemy, they still remain in communication, even aligning themselves on each other, &c. This is an erroneous bad method of carrying out a co-operation, which is liable to a thousand accidents, through which nothing great can ever be effected, and by which one is almost certain to be well beaten if we have to deal with an active, vigorous enemy. The true way is to give each corps, or division Commander, the general control of his march, to give him the enemy as the point on which his march is to be directed, and the victory over the enemy as the object of his march. Each commander of a column has, therefore, the order to attack the enemy where he finds him, and to do so with all his strength. He must not be made answerable for the result, for that leads to indecision; he must be responsible for nothing more than that his corps joins in the fight with all its energies and makes any sacrifice that may be necessary. 11. A well organised independent corps can resist the attacks of a vastly superior force for a certain length of time (some hours) and is, therefore, not to be destroyed in a moment; therefore, if it has even been engaged too soon with the enemy and is beaten, still its action is not lost on the whole; the enemy must have deployed his forces, and expended a certain portion of them on this corps, and thus given our other corps a favourable opportunity for attack. Of the organisation of a corps for this purpose, we shall speak hereafter. We ensure the harmonious action of the whole in concert when each corps has in this manner a certain independence, and seeks out the enemy and attacks him at any cost. 12. One of the most important principles for offensive war is the surprise of the enemy. The more the attack partakes of the nature of a surprise, the more successful we may expect to be. The surprise which the defender effects by the concealment of his dispositions, by the covered position in which he places his troops, the offensive can only effect by the unexpected march to the attack. This is an occurrence which rarely happens in modern warfare. This is partly owing to better measures for the security of an army; partly owing to wars being now prosecuted with more vigour, so that there are not now those long pauses in the operations which lulled the one party to sleep, and gave the other a favourable opportunity to make a sudden attack. Under these circumstance, except by a regular night-surprise (as at Hochkirch), which is always possible, the only way now to surprise an enemy is to make a march to the flank or the rear, and then suddenly return upon him; or if we are at a distance, then by forced marches, and by great efforts, to reach the enemy's position sooner than he expects. 13. The regular surprise (by night, as at Hochkirch), affords the best chance of doing something, when our army is small; but it is attended with more risks for the assailant, if the defender knows the country better than he does. The less we know of the country and of the enemy's arrangements, the greater these risks are; therefore, such attacks, in many instances, can only be regarded as desperate means. 14. In such attacks, all the arrangements must be more simple, and we must keep still more concentrated than by day. (a) That the cavalry should be posted behind the infantry. (b.) That we must not be induced to bring the cavalry into action too soon. The cavalry should not be launched boldly to the attack until such disorder prevails in the enemy's ranks that we may hope for success by his hasty retreat. 2. The fire of artillery produces greater effect than that of infantry. A battery of eight six pounders does not occupy a third part of the front of a battalion of infantry, is worked by an eighth of the number of men composing a battalion, and does certainly twice, if not three times, as much execution with its fire. On the other hand, artillery has the disadvantage of not being so easily moved as infantry. This applies in general, even to the lightest description of horse artillery, for it cannot be used like infantry upon any ground. From the commencement, therefore, the artillery must be kept united at the most important points, because it cannot, like infantry, concentrate itself at those points during the progress of the battle. A great battery of twenty or thirty guns is in most cases decisive at the point where it is placed. 3. From the particulars just specified and others which are evident, the following rules present themselves for the use of the different arms of the service respectively. (a.) The battle is commenced by artillery. The greater proportion of that arm being brought into use from the very first, it is only with large masses of troops that both horse and foot artillery are kept in reserve. Artillery is used in large masses brought together at single points. Twenty or thirty guns defend the principal point in one great battery, or batter the point in the enemy's line which it is intended to attack. (b.) We next use light infantry—either marksmen, riflemen, or fusiliers—principally in order not to bring too many troops into action at once; we try first to feel what there is in our front (for that can seldom be properly examined) we want to see which direction the fight is likely to take. If we can maintain an equal fight with the enemy with this line of skirmishers, and that there is no reason for hastening the affair, we should do wrong to hurry forward other forces; we should weary out the enemy with this kind of fight as much as possible. (c.) If the enemy brings so many troops into the combat as to overpower our line of skirmishers, or if we cannot delay any longer, we bring forward a full line of infantry, which deploys itself at 100 or 200 paces from the enemy, and either opens fire or advances to the charge, according to circumstances. (d.) This is the chief purpose for which the infantry is destined: if we are drawn up in such deep formation that we have still a line of infantry in column in reserve, we are tolerably well master of the combat at this point. This second line of infantry should, if possible, be used only in columns, to decide the day. (e.) The cavalry during this time keeps in rear of the troops engaged in action, as near as it can, without suffering much loss, that is beyond the reach of grape and musketry. It must, however, be at hand, that we may be able to profit by any success which takes place in the course of the combat. 4. In following these rules more or less strictly, we must keep in view the following principle, on which I cannot insist too strongly, viz., not to make a venture with all our forces at once, because we thus throw away all means of directing them; to weary our adversary with as few troops as possible, and keep in hand a considerable mass for the last decisive moment. Once this last reserve is staked, it must be led with the utmost boldness. 5. An order of battle, that is, a method of drawing up the troops before and during the battle, must be established for the whole campaign, or the whole war. This order of battle is to be observed in all cases when there is not time to make special dispositions. It must, therefore, be based chiefly with a view to the defensive. This order of battle will reduce the form or manner in which the army fights to a kind of method, which is very necessary as well as salutary, because a great number of the generals of second order, and other officers at the head of smaller divisions, have little knowledge of tactics, and no special aptitude at all for war. By this, a certain methodicism is instituted which takes the place of art, where the latter is wanting. My persuasion is that this exists to the greatest degree in the French army. a, b is a line of light infantry which opens the battle, and in a broken, uneven country, serves in some measure as an advanced guard; then comes the artillery, c, d, intended to be placed in battery at advantageous points. Until put in position, it remains behind the first line of infantry; e, f is the first line of infantry, intended to deploy and open fire, in this case it is formed of four battalions; g, h, two regiments of cavalry; i, k, the second line of infantry, which constitutes the reserve intended to decide the result of the battle; l, m, its cavalry. According to the same principles, a similar disposition may be established for a corps of larger proportions: at the same time it is not essential that the order adopted should be precisely that now laid down, it may differ in some respects, so that it is in conformity with the foregoing principles. Thus, for instance, the usual position of the cavalry, g h, may be in the line l m, and then it is only brought forward when it is found to be too far in rear at l m. (a.) To press upon the enemy, if he retreats from the field, and to attack the cavalry which he employs in covering his retreat. If the enemy's cavalry is beaten at that moment, great results must follow, unless the enemy's infantry performs prodigies of valour. Small bodies of cavalry will not answer the purpose on such an occasion. (b.) To hasten the pursuit of the enemy if, without being beaten, he makes a retreat; or if, after a lost battle, he continues to retire on the following day. Cavalry marches quicker than infantry, and is more dreaded by troops that are retreating. And next to beating, the enemy, the pursuit is the most important thing in war. (c.) If our object is to make a great turning movement (to turn the enemy strategically), and on account of the detour we must employ an arm which marches quicker, then we may take this reserve cavalry for the purpose. In order to make this corps more independent, horse artillery should be attached to it; for there is greater strength in a combination of several arms. 8. The order of battle for the troops has relation to the battle; it is their disposition for that end. (a.) Each complete corps (whether brigade or division) has its own advance and rear-guard, and forms a column of itself; that does not, however, prevent several such corps from marching on the same road one after another, and thus, to a certain extent, forming as a whole one great column. (b.) The corps march according to their position in the general order of battle; that is to say, according as their appointed place in that order may happen to be in line with, or in rear of, each other, so they march. (c.) In the corps themselves the following order is invariably observed; the light infantry form the advanced and rear guards, accompanied by a proportion of cavalry; then follows the infantry; then the artillery; last of all, the rest of the cavalry. This order is kept, whether we move against the enemy—in which case it is the natural order—or parallel with the enemy, in which case, properly, those who in the order of battle are to stand behind one another, should march side by side. If we have to form line of battle, there can never be want of time to such a degree that we cannot withdraw the cavalry and the second line by one flank or the other. 1. The terrain (the ground or country) gives two advantages in war. The first is, that obstacles to approach are thus presented which either render it impossible for an enemy to reach certain points, or compel him to march slowly, to keep in column, etc. The second is, that obstacles of ground enable us to conceal the position of our troops. Both advantages are very important, but the second appears to me the greatest: at all events it is certainly the one which we can most frequently make use of, because, even the most level country, in most cases, still allows of drawing up troops more or less under cover. Formerly, the first of these advantages was almost the only one known, and very little use was made of the second. Now the mobility of all armies is such, that the first is of less service, and just on that account we must make use the more frequently of the second. The first of these two advantages is only serviceable in the defensive, the second, in both attack and defence. (b.) as a means of strengthening the front. 3. As a fit support for a flank, an obstacle should be quite impassable—such as a large river, a lake, an impassable swamp. These are all impediments which are rarely met with, and therefore perfect supports for the flanks are seldom to be found, and the want of them is felt now more frequently than formerly, because armies move more, do not remain so long in one position, consequently require a greater number of positions in the theatre of war. If the obstacle to approach is not an impassable barrier, then it is, properly speaking, no point d'appui for a flank, it is only a point which strengthens the position. Troops must then be placed behind it, and then again it becomes in relation to these an obstacle to approach. It is certainly always of advantage to strengthen the flanks in this manner, as fewer troops are then required at those points; but we must take precautions against two things: the first is, placing too much reliance on such supports for the flank, and thus neglecting to have strong reserves behind them; the second is, covering both wings with obstacles of this description, for as they do not completely secure either, they do not prevent the possibility of a combat on both flanks; this may easily become a most disadvantageous defensive, for the obstacles will not allow us easily to sally forth with an active defence on one wing, and thus we may be reduced to defend ourselves in the most unfavourable of all forms, with both flanks thrown back, a d, c b. 4. These considerations lead again to the deep order of battle. The less we are able to find secure support for the wings, the more corps we must have in rear, with which we may in turn outflank any portion of the enemy's army which shall seek to act against our flank. 5. All kinds of ground which cannot be passed by troops marching in line, all villages, all enclosures of parcels of ground by hedges and ditches, marshy meadows, lastly—all hills which can only be mounted with some difficulty, come under the head of terrain-hindrances of this kind, that is, of obstacles that cannot be passed except with difficulty, and slowly; and which, therefore, add greatly to the strength of the troops posted behind them in the combat. Woods can only be included in this category when the underwood is very thick and the ground marshy. A common wood of high trees is as easy to pass as a plain. There is one point, however, in respect to a wood which must not be overlooked, that is, that it may serve to conceal the enemy. If we place ourselves inside it, then there is the same disadvantage for both sides; but it is very dangerous, and at the same time a great mistake to have woods in front or on the flank. Such a thing can never be allowable unless there are very few roads by which they can be traversed. Abattis intended to bar the passages are so easily removed that they are not of much use. 6. From all this it follows that we should endeavour to make use of such obstacles upon one flank, in order to offer there a relatively strong resistance with few troops, whilst we carry out our intended offensive on the other flank. With these obstacles, the use of entrenchments may be combined with great advantage, because then, if the enemy passes the obstacle, the fire from the entrenchments may secure our weak force from being overwhelmed by superior numbers, and thrown back too suddenly. 7. When we are on the defensive, every obstacle covering our front is of great value. All hills on which positions are taken up are only occupied on this account; for an elevated position has seldom any important influence, often none at all, on the effect of the arms in use. If we stand above the enemy as he approaches, he must ascend with difficulty, therefore he advances only slowly, his ranks get into disorder, and he reaches us with his physical powers exhausted, advantages for us which, with equal bravery and numbers on each side, ought to be decisive. The great effect morally of a rapid charge at full speed is a point which must not on any account be overlooked. The soldier who is advancing becomes insensible even to danger, the one who is standing still loses his presence of mind. It is therefore always advantageous to place the first lines of infantry and artillery on high ground. If the slope of the hill is so steep, its declivity so broken and uneven, that we cannot sweep it well with our fire, which is often the case, then, instead of placing our front line on the summit ridge, that part should at most only be occupied by skirmishers, and the full line should be so placed on the reverse slope, that at the moment when the enemy reaches the summit ridge and begins to rally his ranks, he is exposed to the greatest fire. All other local features which form obstacles to approach, such as small rivers, streams, hollow ways, etc., serve to make breaks in the enemy's front. He must, after passing them, halt to reform, and that delays him; therefore he should then be brought within range of our most effectual fire. The most effectual fire is grape (400 to 600 yards), if there is plenty of artillery available; the fire of musketry (150 to 200 yards), if there is little artillery at hand. 8. Through this it becomes a rule to include within the zone of our most effective fire, every obstacle to approach with which we wish to strengthen our front. But at the same time, it is important to observe, that our whole defence should never depend entirely on our fire, but a considerable portion of our troops (one-third to one-half) should always be kept ready to attack with the bayonet. Therefore, if we are very weak, we must merely place the line of fire (riflemen and artillery) near enough to cover the obstacle with their fire, and place the rest of the troops in columns 600 or 800 yards further back, and if possible under cover. 9. Another way of making use of obstacles to approach in front, is to let them be a little further in front of our line, so that they shall be within the effective range of cannon-shot (1,000 to 2,000 yards), and if the enemy's columns pass them then, to attack him from all sides. (At Minden, the Duke Ferdinand did something like this.) In this manner an obstacle of ground is favourable to the plan of actively defending ourselves; and this active defence, of which we have already spoken elsewhere, then takes place on our front. 10. In the preceding observations, obstacles of ground and country have been considered chiefly as connected lines in relation to extensive positions, but it is necessary to say something about single points. In this case, entrenchments are indispensable, because the enemy can always advance against the defender with a front more or less extended, and the defender must then at last be taken in rear, because he will rarely be strong enough to show a front on all sides. Under this term, we include every narrow way forming the only approach by which the enemy can reach a particular point. Bridges, embankments, rocky gulleys with precipitous sides, belong to this class. In respect to all these cases, it is to be observed, that either it is impossible for the assailant to turn the obstacle, as, for instance, a bridge over a great river; in which case then the defender may boldly use all his force in order to bring as much fire as possible to bear on the point of passage, or we are not secure against the obstacle being turned, as in the case of bridges over small streams, and the greater number of mountain defiles; then it is necessary to reserve a considerable part of the force (one-third to one-half) for an attack in close order. (c) Buildings and Enclosures, Villages, small Towns, etc. If troops are brave and carry on a war with enthusiasm, there is no place or condition of things in which a few can so well resist many as in the defence of houses. But if we are not quite certain of the men individually, it is better only to occupy the houses, gardens, etc. with riflemen, and to plant cannon at the approaches, and to draw up the greater part of the troops (one-third to one-half) in close column, in the place itself, or behind it under cover, in order to rush upon the enemy with this reserve, when he attempts to enter. 11. These isolated posts serve the great operations partly as outposts, not intended to offer an absolute defence, but mostly only to detain the enemy, partly, at points which are of importance in the combinations planned for the whole army. It is also often necessary to hold a distant point, in order to gain time for the development of active defensive measures which we have in view. If the point is remote, it is naturally on that account isolated. 12. It is only now necessary to add two remarks concerning isolated points, the first is, that we must hold troops in readiness behind these points for the detachments to rally upon in case of being driven out; the second is that whoever includes such a defence in the series of his combinations, should never reckon too much upon it, let the strength of the natural obstacles of ground be ever so great; that on the other hand, whoever is entrusted with the defence, must determine to carry out the object, let circumstances be ever so adverse to him. For this, a spirit of resolution and self-devotion is required which can only spring from a thirst for glory and from enthusiasm: for this reason, people must be chosen for such duties who are not deficient in these noble qualities of the soul. 13. All that concerns the use of the ground as a means for covering our position and our march up to occupy it, requires no elaborate exposition. We do not now place ourselves on a hill we wish to defend (as was often done formerly) but behind it: we do not place ourselves before a wood, but in it, or behind it; the latter only when we can overlook the wood or thicket. We keep our troops in columns that they may be the more easily concealed; we take advantage of villages, plantations, all undulations of the ground, in order to conceal our troops behind them; in advancing we choose the most broken intersected country, etc. In cultivated countries there are hardly any localities so much overlooked that it is not possible by a skilful use of such obstacles and features as the ground presents, to keep a great part of the troops on the defensive from being seen. For the assailant, there is more difficulty in keeping a march secret, because he must follow the high road. Of course, when the ground is made use of for purposes of concealment of troops, this must be done with a due regard to the end and the combinations which have been decided upon; therefore, in this we must take care above all things that we do not pull to pieces the order of battle, although some small deviations may be allowable. (a.) Support of one or both flanks. (b.) Open view before front and flanks. (c.) Obstacles to the approach in front. (d.) Masked positions for troops. (e.) A broken country in rear, because that makes pursuit difficult in case of disaster; but no defiles too near (as at Friedland), for that causes delay and confusion. 15. It would be pedantic to suppose that all these advantages are to be obtained at every position which it is necessary to take up in war. All positions are not of equal importance; their importance increases in proportion to the probability of our being attacked in them. It is only in the most important that we try to combine, if possible, all these advantages; in others we try to do so more or less. 16. The considerations which the assailant has to study in respect to ground, are principally embraced in two leading points: not to choose an over difficult country for the point of attack; and next, on all occasions to advance through the country so that the enemy can see as little as possible of our movements. 17. I close these observations on the use of ground, with a maxim of the highest importance for the defence, and which is to be regarded as the key-stone of the whole theory of defence, which is:—Not to expect everything from the strength of the ground, consequently never to be enticed into a passive defence by a strong country. For if the country is in reality so strong that it is impossible for the assailant to drive us out of our position, he will turn it, which is always possible, and then the strongest country is useless; we are then compelled to fight under quite different circumstances, in quite a different country; and we might as well not have included the other locality in our combinations. But if the ground is not of such strength, if it is possible to attack it, still the advantages of such a position will never outweigh the disadvantages of a passive defence. All obstacles of ground must therefore only be taken advantage of for a partial defensive, in order to offer a relatively great resistance with few troops, and to gain time for the offensive, by which the real victory is to be gained at other points. THIS the combination of the single battles of a war, in order to attain to the object of the campaign, or war. If we know how to fight, if we know how to conquer, there is not much more wanted; to combine successful results is easy, because it is merely an affair of a well-practised judgment, and does not depend, like the direction of a battle, on special knowledge. All that is essential in the few principles which there are, and which depend chiefly on the constitution of States and armies may, therefore, be brought within a small compass. (a.) To conquer and destroy the enemy's armed force. (b.) To get possession of the material elements of aggression, and of the other sources of existence of the hostile army. (c.) To gain public opinion. 2. To attain the first of these objects, the chief operation must be directed against the enemy's principal army, or at least against a very important portion of the hostile force; for it must be beaten before we can follow up the other two objects with success. 3. In order to seize the material forces, operations are directed against those points at which those resources are chiefly concentrated: principal towns, magazines, great fortresses. On the road to these, the enemy's principal force, or a considerable part of his army, will be encountered. 4. Public opinion is ultimately gained by great victories, and by the possession of the enemy's capital. 5. The first and most important maxim which we can set before us for the attainment of these objects, is: to employ all the forces which we can make available with the utmost energy. In every modification which manifests itself in these respects, there is a shortcoming as respects the object. Even if the result is tolerably certain in itself, it is extremely unwise not to use the utmost efforts to make it perfectly certain; for these efforts can never produce injurious effects. Let the country suffer ever so much by it, no disadvantage can arise from that, because the pressure of the war is the sooner removed. The moral impression produced by vigorous preparations is of infinite value; every one feels certain of success: this is the best means of raising the spirits of the nation. 6. The second principle is to concentrate our force as much as is possible at the point where the decisive blows are to be struck, to run the risk even of being at a disadvantage at other points, in order to make sure of the result at the decisive point. The success at that point will compensate for all defeats at secondary points. 7. The third principle is: not to lose time. If no special and considerable advantage will arise by delay, it is important to commence work as quickly as possible. By rapidity, many measures of the enemy are nipped in the bud, and public opinion is gained in our favour. Surprise plays a much greater part in strategy than in tactics; it is the most powerful element of victory; Alexander, Hannibal, Cæsar, Gustavus Adolphus, Frederick II, Napoleon, owe the brightest rays of their fame to their promptitude. 8. Lastly, the fourth principle is: to follow up the success we gain with the utmost energy. The pursuit of the enemy when defeated, is the only means of gathering up the fruits of victory. 9. The first of these principles is the foundation of the three others. If we have followed the first principle, we can venture any length with respect to the others, without risking our all. It gives the means of continually creating new forces behind us, and with fresh forces, every disaster may be repaired. In this, and not in going forward with timid steps, lies that prudence which may be called wise. 10. Small states, in the present day, cannot make any wars of conquest; but, at the same time, for a defensive war, even their means are very great. Therefore I am perfectly convinced: that whoever calls forth all his powers in order to appear incessantly with new masses, whoever adopts every imaginable means of preparation, whoever concentrates his force at the decisive point, whoever thus armed pursues a great object with resolution and energy, has done all that can be done in a general way for the strategical conduct of the war, and that unless he is altogether unfortunate in battle, he will undoubtedly be victorious in the same measure as his adversary has fallen short of this exertion and energy. 11. Due attention being paid to these principles, the form in which the operations are carried on, is in the end of little consequence. I shall, however, try to explain, in a few words, what is most important. In tactics, we seek always to get round the enemy, that is to say, that portion of his force against which our principal attack is directed, partly because the convergent action of the combatant force is more advantageous than the parallel, partly because it is the only method of cutting the enemy off from his line of retreat. If this, which relates to the enemy and his position tactically, is used strategically, and applied to the enemy's theatre of war (therefore, also, to his subsistence lines), then the separate columns, or armies, which should envelop the enemy, will be, in most cases, so far apart from each other that they cannot take part in one and the same battle. The enemy will be in the middle, and may be able to turn with the mass of his forces against these corps singly, and beat them in detail. Frederick II. 's campaigns furnish examples of this, more especially those of 1757 and 1758. Now as the battle is the principle affair, the decisive one, the party acting on converging lines, unless he has a most decisive superiority in numbers, will lose by battles all the advantages which the enveloping movement would have gained for him; for an operation against the lines of communication only takes effect very slowly, but victory in the battle very quickly. Therefore, in strategy, he who finds himself in the midst of his enemies, is better off than his opponent who tries to envelop him, particularly if the forces on each side are equal, and of course still more so if there is an inferiority on the enveloping side. A strategic enveloping or turning movement is no doubt a very effective means of cutting the enemy off from his line of retreat; but as this object may also just as well be attained by a tactical turning movement, the strategic enveloping movement is therefore never advisable unless we are (physically and morally) so superior, that we shall be strong enough at the decisive point, and yet can at the same time dispense with the detatched corps. Napoleon never engaged in attempts to turn his enemy strategically, although he was so often, indeed almost always, both physically and morally superior. Frederick II. only did it once, in the attack on Bohemia, 1757. Certainly by that means the Austrians were prevented from bringing on a battle until they got to Prague; but what was the benefit to him of the conquest of Bohemia as far as Prague, without a decisive battle? The battle of Kollin forced him to give it up again—a proof that battles decide all. At Prague he was obviously in danger of being attacked by the whole of the Austrian forces before the arrival of Schwerin. He would not have exposed himself to this danger if he had marched through Saxony with all his forces united. The first battle would in that case probably have been fought at Budin on the Eger, and that would have been as decisive as the Battle of Prague. This concentric march into Bohemia was unquestionably a consequence of the Prussian army having been broken up during the winter in cantonments in Silesia and Saxony, and it is of importance to observe, that reasons of this kind, in most cases, are more influential than the advantages in the form of the disposition itself, for the facility of operations is favourable to their rapid execution, and the friction inherent in the immense machinery of a great armed force, is in any case so great, that we should never add to it except from necessity. (b.) That with a few troops and the help of natural and artificial obstacles we shall be able to harass him in such a manner on the road which his principal force must take, that no conquests he can make in that direction will compensate for the loss of his base. 13. The subsistence of troops being a condition which is indispensable in the conduct of war, it has a great influence on the operations of the war, particularly in this way, that it will only allow of the concentration of troops to a certain degree; and as it must be considered in the choice of the line of operations, therefore it has an influence in determining the theatre of war. 14. The subsistence for troops is provided, whenever the state of a country allows of it, at the cost of the country, by requisitions. According to the present mode of making war, armies take up considerably more space than formerly. The formation of separate independent corps has made this possible without our being placed at a disadvantage if opposed to an enemy who is concentrated in the old manner (with 70,000 to 100,000 men) at one spot; for one of these corps, so organised as they now are, can sustain itself for some time against an enemy twice or three times superior in numbers; during this time other corps arrive, and therefore, even if this corps is actually beaten, it will not have fought in vain, as we have already observed elsewhere. Accordingly, now, single divisions or corps take the field, marching separately either in line with each other, or in succession one after another, and only so far in connection, that, if they belong to the same army, they can take part in any battle which may occur. This makes it practicable to subsist an army for a time without magazines. It is facilitated by the organisation of the corps itself, by its staff and its commissariat department. 15. When important reasons (as for instance the position of the enemy's principal army) do not decide otherwise, one should choose the richest and most productive provinces to operate in, for facility of subsistence promotes rapidity of movement. There is nothing which in importance surpasses the subsistence, except the position of the enemy's principal army, which we are seeking, the situation of the capital city, or strong place which we wish to take. All other considerations, for instance, the advantageous form of drawing up the armed force (order of battle), of which we have already spoken, are, as a rule much less important. 16. In spite of this new method of subsisting, we are very far from being able to dispense with all magazines, and a wise commander, even if the resources of the province are quite sufficient, will not neglect to form magazines behind him as a provision against unforeseen events, and so as to be able the more readily to concentrate his strength at certain points. This is one of those measures of precaution which are no detriment to the main object. 1. In political language, a defensive war is one which a State carries on to maintain its independence: in strategy, a defensive war is a campaign in which we limit ourselves to contending with the enemy in a theatre of war which has been prepared by us for the purpose. Whether the battles we fight in this theatre of war are offensive or defensive, makes no difference in this respect. 2. We choose the strategic defensive chiefly when the enemy is superior in force. Naturally, fortresses and entrenched camps, which are to be regarded as the chief preparations of a theatre of war, afford great advantages, to which may be added knowledge of the country and the possession of good maps and surveys. With these advantages, a small army, or an army which is based on a small State and limited resources, will be more in a condition to oppose the enemy than without the aid of such assistance. There are besides the two following grounds upon which we may choose the defensive form of war by preference. First.—If the poverty of the provinces surrounding our theatre of war, makes the operations of war extremely difficult on account of the question of subsistence. In that case we escape the disadvantage, and the enemy must submit to it. This is, for instance, at this moment (1812) the case of the Russian army. Secondly.—If the enemy has greater advantages for carrying on the war. In a theatre of war prepared, which we know, where all the surrounding circumstances are in our favour, war is more easily conducted, there will not be so many faults committed. In this case, that is, when the little dependence to be placed on our troops and generals compels us to resort to the defensive, we gladly combine the tactical defensive with the strategic, that is, we give battle in positions prepared beforehand; we do so further because there is less risk of our committing faults. 3. In defensive war just as much as in the offensive, a great object should be pursued. This can be nothing else than to annihilate the enemy's army, either in a battle, or by making his subsistence so difficult as to produce disorganisation and compel him to retreat, by which he must necessarily suffer considerable losses. Wellington's campaign in the years 1810 and 1811 is an instance of this. The defensive war, therefore, does not consist in an indolent waiting for events; we must only pursue the waiting-for system where there is a palpable and decisive utility in that mode of procedure. That sort of calm before a storm, whilst the offensive is gathering up new force for great blows, is extremely dangerous for the defender. If the Austrians, after the battle of Aspern, had reinforced themselves to three times the strength of the French Emperor, which they certainly might have done, then the time of rest which took place before the battle of Wagram might have been advantageous to them, but only on that condition; as they did not do so, that was only so much lost time for them, and it would have been wiser if they had taken advantage of Napoleon's critical position to reap the fruits of their success at Aspern. 4. Fortresses are intended to occupy an important part of the enemy's army in besieging them. This period must, therefore, be taken advantage of to beat the rest of the army. Our battles should be fought behind our fortresses, not in front of them. At the same time, however, we must not quietly look on at their being captured, as Benningsen did during the siege of Dantzig. 5. A great river, that is, such as we cannot build a bridge across without considerable difficulty, rivers like the Danube, below Vienna, and the Lower Rhine, afford a natural line of defence: not by distributing our forces equally along its banks, and seeking to hinder the passage absolutely, which is a dangerous measure, but by watching it, and when the enemy passes then falling upon him from all sides just at the moment when he has not yet got all his forces under command, and is still hemmed in within a narrow space close to the river. The battle of Aspern is an instance. At the battle of Wagram the Austrians, without any necessity, allowed the French to get possession of far too much space, by which means they did away with the disadvantages peculiarly inherent to the passage of a river. 6. Mountains are the second natural obstacles of ground which afford a good line of defence, as we can either have them in front, and only occupy them with a few light troops, treat them to a certain extent as a river which the enemy must cross, and as soon as he debouches with his single columns, fall upon one of them with our whole weight, or we may ourselves take position in the mountains. In the last case, we must only defend the single passes with small corps, and a considerable part of the army (a third or a half) must remain in reserve, in order to fall in superior numbers on any column which forces its way through. This great reserve must, however, not be split up with a view to absolutely preventing all the columns from passing, but we must, from the first, resolve to make use of it to attack that column which we suppose to be the strongest. If, in this way, we rout a considerable part of the enemy's force, the other columns which have forced their way through, will of themselves retire again. The formation of mountain ranges in general is such that about the centre of the masses, there are plateaux or plains at a greater or less elevation, and the sides next to the level country are intersected by deep valleys forming the entrances or avenues. The defender, therefore, has in the mountains a district in which he can make rapid movements right or left, whilst the attacking columns are separated from each other by steep, inaccessible ridges. It is only a mountain mass of this kind that is well adapted for a good defence. If it is rugged and impassable, generally throughout, so that the corps on the defensive must be scattered and disconnected, then to undertake the defence with the principal army is a dangerous measure, for under such circumstances all the advantages are on the side of the assailant, who can fall upon any of the isolated posts with far superior numbers, as no pass, no single post is so strong that it cannot soon be taken by superior numbers. 7. With regard to mountain warfare, it is specially to be observed, that in it a great deal depends on the aptitude of subordinate officers, but still more on the high spirit which animates the ranks. Great skill in manœuvring is not here requisite, but a military spirit and a heart in the cause, for every one is more or less left to act independently; this is why national levies find their account in mountain warfare, for while they are deficient in the first quality, they possess the other in the highest degree. 8. Lastly, in respect to the strategic defensive, it is to be observed, that while it is in itself stronger than the offensive, it should only be used to gain the first great result, and that if this object is attained, and peace does not immediately follow upon that, greater results can only be obtained by the offensive; for whoever remains always on the defensive, exposes himself to the disadvantage of always carrying on the war at his own expense. No state can endure that for more than a certain time; and therefore, if it exposes itself to the blows of its adversary without ever striking in return, it is almost sure in the end to become exhausted, and be obliged to submit. We should therefore begin with the defensive, that we may with the more certainty end with the offensive. 1. The strategic attack pursues the aim of the war directly, for it is aimed directly at the destruction of the enemy's armed force, whilst the strategic defence seeks to obtain this object partly only indirectly. From this it comes that the principles of the attack are already contained in the general principles of strategy. Only two subjects require special mention. 2. The first is the keeping the army constantly complete in men and arms. To the defender, this is relatively easier, from the proximity of his resources. The assailant, although in most cases possessed of the resources of a powerful state, must bring his means more or less from a distance, and therefore, of course, with greater difficulty. That he may not run short in means, he must make such arrangements that the levy of recruits and transport of arms anticipate his wants in these respects. The roads on his line of operations must be incessantly covered with reinforcements and trains of supplies moving to the front; on those roads, military stations must be formed to expedite the transport. 3. Even in the most prosperous circumstances, and with the greatest moral and physical superiority, the assailant must keep in view the possibility of a great change of fortune. For this reason, he must provide points on the line of operations suitable for refuge, in the event of his army being beaten. Such are, fortresses with entrenched camps, or simply entrenched camps. Large rivers afford the best means of checking the pursuit of an enemy for a time. We should therefore secure the passages across them with bridge heads, surrounded with a girdle of strong redoubts. For the defence of these points, and as garrisons for important towns and fortresses, troops, in greater or less number, must be left behind, according as we have to apprehend attacks from the enemy or the hostility of the inhabitants of the country. These, with the reinforcements coming up, form new corps, which in case of success, follow the army, but in case of disaster, are stationed at the points which have been fortified to secure the retreat. Napoleon always showed great foresight in the provision he made in this manner in the rear of his army; and in that way, even in his boldest operations, he incurred less risks than might be imagined at first sight. The principles of the art of war are in themselves very simple, and are quite within the compass of sound, common sense; and although in tactics they rest rather more than in strategy upon special knowledge, still even this knowledge is so limited, that it can hardly be compared with any other science, either in diversity or extent. Learning and profound science are, therefore, not at all requisite, nor are even great powers of understanding. If any special faculty of the understanding, besides a practised judgment is required, it is clear from all that precedes, that it is a talent for artifice or stratagem. The exact contrary has been long maintained, but merely from a misplaced feeling of awe regarding the subject, and from the vanity of authors who have written on the subject. An impartial consideration must convince us of this: but experience tends to impress upon us this conviction still more forcibly. In the late revolutionary war, many men have made themselves conspicuous as skilful generals, often as generals of the first order, without having had the benefit of any military education. As regards Condé, Wallenstein, Suwarrow, and many others, it is at least a very doubtful point. That the conduct itself of war is very difficult is a matter of no doubt; but the difficulty is not that special learning, or great genius, is required to comprehend the true principles of conducting war; that can be done by any well-organised head, with a mind free from prejudice, and not altogether ignorant of the subject. Even the application of these principles on a map, and on paper, presents no difficulty; and even a good plan of operations is still no great masterpiece. The great difficulty is to adhere steadfastly in execution to the principles which we have adopted. The object of this concluding observation, is to fix attention on this difficulty, and to give your Royal Highness a lucid and distinct idea of it, for I look upon that as being the most important point which I can attain by this paper. The whole conduct of war is like the action of a complicated machine, with an immense amount of friction; so that combinations which are easily made on paper, can only be carried into execution by very great exertion. Therefore the free will, the mind of the general, finds itself impeded in its action at every instant, and it requires a peculiar strength of mind and understanding to overcome this resistance. By this friction, many a good idea is lost, and we are obliged to lay down a plain, simple scheme, when by a somewhat more complicated one, greater results might be attained. 1. We always know much less of the actual condition and of the designs of the enemy, than we assume on supposition in forming our plans; innumerable doubts rise up at the moment of the execution of a resolution, doubts caused by the dangers to which we see we are exposed, if it should prove that we have been much deceived in the conjectures we have formed. That feeling of anxiety which so easily seizes men in general in the execution of great designs, then overpowers us, and from this state of anxiety to a state of irresolution, from that to half measures, is a short step not perceptible. 2. Not only are we uncertain as to the strength of the enemy, but rumour (all intelligence which we receive through outposts, spies, or by accident) increases his numbers. The great masses of the people are timid by nature, and thereby danger is invariably exaggerated. All the influences brought to bear on the general, therefore, tend to give him a false impression of the strength of the enemy before him; and herein lies a new source of irresolution. We cannot imagine the full extent of this uncertainty; and it is, therefore, important to prepare for it beforehand. If we have quietly reflected on everything beforehand, if we have impartially considered, if we have sought for, and if we have made up our minds on the probabilities of the case, we should not be ready to give up at once the first opinion, but carefully criticise reports as they come in, compare several with each other, send out for further information, etc. Very often, by this means, false intelligence is detected on the spot; often the first information is confirmed; in both cases, therefore, we attain to certainty, and can form a resolution accordingly. If we cannot obtain this certainty, then we must say to ourselves that in war nothing can be carried out without a risk; that the nature of war never allows us thoroughly to see, at all times, which way we are going; that the probable will still always remain the probable, even if it does not strike upon our senses at once; and that if we have made judicious arrangements generally, we shall not be completely ruined at once, even if there is one error. 3. The uncertainty as to the existing state of things at any given moment, applies to our own army as well as the enemy's. Our own army can seldom be kept so concentrated that we can at any moment clearly command a view of all parts. Now, if we are disposed to be anxious, then new doubts will thus arise. We shall wish to wait and see, and a delay in the action of the whole is the inevitable consequence. We must, therefore, feel so much confidence in the arrangements we have made as to believe that they will meet our expectations. To this belongs in especial manner a reliance on the subordinate generals; we must, therefore, make it a rule to select officers upon whom we can rely, making every other consideration give way to that If we have made the dispositions which are suitable, if we have provided for contingent mishaps, and so arranged that in case such should occur during the execution of our measures, we shall not be completely ruined, then we must step boldly forward through the night of uncertainty. 4. When we want to carry on a war which causes a great strain upon our powers, then subordinate generals, and even the troops (if they are not used to war) will often find obstacles which they represent as insuperable. They will find the march too long, the fatigue too great, the subsistence impracticable. If we should listen to all these difficulties, as Frederick II. called them, we should soon have to succumb to them, and remain powerless and inactive instead of acting with force and energy. To withstand all this, a degree of confidence in our own sagacity and convictions is requisite, which commonly looks like obstinacy at the moment, but which is that power of the understanding and character which we call firmness. 5. None of the effects upon which we calculate in war, come to pass so exactly as any one would imagine who has not watched war attentively and been accustomed to it in reality. We often make a mistake of several hours as to the march of a column, and yet we are unable to tell where to fix the cause of the delay; obstacles often present themselves which could not be calculated upon beforehand; often we expect to arrive at a certain point with an army, and find ourselves obliged to halt some miles short of it; often a post which we have established, renders much less service than we expected; one of the enemy's, on the contrary, much more; often the resources of a province do not amount to as much as we anticipated, &c.
Any such obstruction can only be got over by great efforts, which the general can only succeed in getting by strictness bordering on severity. Only by such means, only when he is certain that the utmost possible will be done, can he feel secure that these little impediments will not exercise a great influence on his operations, that he will not fall short of the object which he proposed to attain. 6. We may feel certain that an army is never in the condition in which a person following its operations in a room supposes it to be. If he is in favour of the army, he will figure it to himself as being from a third to a half stronger and better than it really is. It is natural enough that the commander should find himself in the same case in relation to the first plan of his operations, that he should afterwards see his army melt away in a manner he never anticipated, his artillery and cavalry become unserviceable, &c. Thus, what appeared to the observer and the general as possible and easy at the opening of the campaign, will often prove difficult or impossible in the execution. Now, if the commander is a man, who, impelled by a lofty ambition, still follows his object with boldness and energetic will, then he will attain it, whilst an ordinary man will think himself fully justified in abandoning it, owing to the condition of his army. Massena showed in Genoa and in Portugal, the power which a general has over his troops through the strength of his will; in the one case by the force, we might say the severity, of his character, he drove the men to extraordinary exertions, which were crowned with success; in the other, in Portugal, he held out, at least, much longer than any one else would have done. In most cases, the enemy's army finds itself in a similar condition; think of Wallenstein and Gustavus Adolphus at Nuremberg, of Napoleon and Benningsen after the battle of Eylau. The state of the enemy we do not see, our own is before our eyes; therefore, the latter makes a much greater impression than the former, because in ordinary mortals sensuous impressions are more powerful than the language of the understanding. 7. The subsistence of the troops in whatever way it may be managed, (whether by magazines or requisitions), presents such difficulties that it must always have a very decisive voice in the choice of measures. It is often opposed to the most effectual combination, and an army is compelled sometimes to go in quest of its subsistence, when it might be on the way to victory, to brilliant successes. Through this, chiefly, the whole machine acquires that unwieldiness by which the effects realised fall far short of the flight of great plans. A general who, with a tyrannical power, demands from his troops the utmost efforts, the most extreme hardships; an army accustomed to these sacrifices through wars of long duration:—what advantages will they not have over their opponents, how much more rapidly will they pursue their object in spite of all obstacles! With equally good plans, how different will be the result! The sensuous impressions which come before us in the course of execution, are more vivid than those obtained previously through mature reflection. They are, however, only first appearances of things, and that, as we know, seldom corresponds exactly with reality. We are, therefore, in danger of sacrificing our mature reflection to first appearances. That this first appearance, as a rule, produces fear and over caution, is owing to the natural timidity of man, who takes only a partial view of everything. Against this, we must, therefore, arm ourselves, and place a firm reliance on the results of our own past mature reflections, in order to fortify ourselves by that means against the weakening impressions of the moment. Your Royal Highness must therefore make yourself acquainted with these principles, with a view to proving them by the study of military history, and seeing where they coincide with the course of actual events, and where they are modified or overthrown by the same. But, besides this, the study of military history is the only means of supplying the place of actual experience, by giving a clear idea of that which we have termed the friction of the whole machine. To this end we must not confine ourselves to the leading events, much less keep to the reasoning of historians, but study details as much as is possible. For historians rarely make perfect fidelity of representation their object: in general, they desire to embellish the deeds of their army, or to prove a consonance between actual events and some imaginary rules. They invent history, instead of writing it. Much reading of history is not required for the above object. The knowledge of a few separate battles, in their details, is more useful than a general knowledge of several campaigns. On this account it is more advantageous to read particular narratives and journals than regular works of history. The account of the defence of Menin, in the year 1794, in the memoirs of General Scharnhorst, is a pattern of this kind of narration which cannot be surpassed. This narrative, especially the account of the sortie, and the mode in which the garrison cut their way through the enemy, will serve Your Royal Highness as a criterion for the style in which military history should be written. No battle in the world has more thoroughly convinced me, that in war we should not despair of success up to the last moment, and that the effects of good principles, which can never manifest themselves in such a regular manner as we suppose, will unexpectedly make their appearance, even in the most desperate cases, when we believe any such influences are completely lost. Some great sentiment must stimulate great abilities in the general, either ambition, as in Cæsar, hatred of the enemy, as in Hannibal, the pride of falling gloriously, as in Frederick the Great. Open your heart to a feeling of this kind! Be bold and astute in your designs, firm and persevering in executing them, determined to find a glorious end, and destiny will press on your youthful brow a radiant crown—fit emblem of a prince, the rays of which will carry your image into the bosom of your latest descendants.